At a recent Stamp-In, my girls had fun with lions and the circus -- er, I mean circles. To tell the truth, it was a fun card to design! I think any kid or kid-at-heart would enjoy receiving this happy card. Of course, I HAD to pop up the lion's head. Isn't he just the cutest little guy? In the mood to make a little Ring Around the Lion card yourself? Here's how! To make the circles, I nested several of the Circle Collection Framelits inside each other on Melon Mambo, Pumpkin Pie and Crushed Curry cardstock and ran it through the Big Shot. All those nested circles simply popped apart and you have lots of circles with only a few run-throughs on the Big Shot. Adhere the circles and dots as you wish atop the card front. Let some of them hang over the edges so they aren't just confined to the center of the card. Snip off the edges flush with the sides of the card. This makes it look so much more natural. 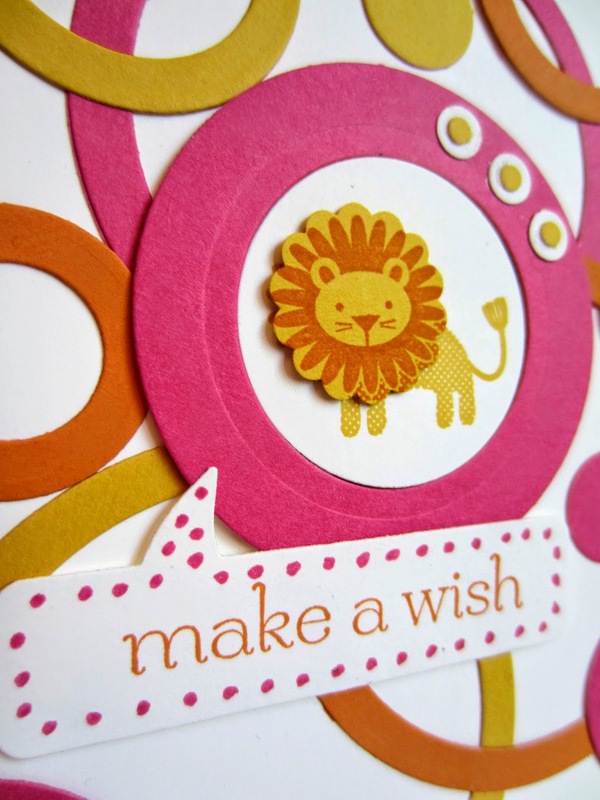 Use the Corner Rounder Punch to round all the corners of the card. 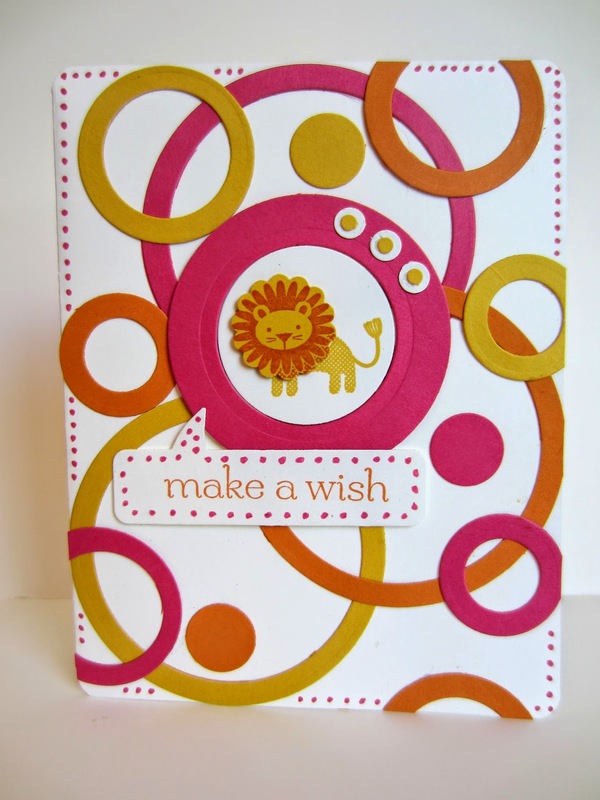 Attach the pink circle onto the card front with Stampin' Dimensionals. Yes, that's right. Just put him right over some of the circles you had already adhered to the card front. On a scrap of Whisper White cardstock, stamp "make a wish" in Pumpkin Pie ink. Cut out this word bubble with the appropriate Framelit in the Big Shot. Use the Melon Mambo Stampin' Write Marker to add dots around the word bubble, as well as around the edges of the card in between the circles. Attach the word bubble to the card front with Stampin' Dimensionals. I loved doing this card! It was a fun card to make. Although yours was the best! Such a cute card, Thanks to for stopping by this week, wishing you a great weekend, Happy Day to all Fathers in your family!!! This is really cute! I have some crafty friends who will enjoy this! Thanks again for joining us on Mondays Reflections, I just Tweeted your post!! Adorable! Thanks for sharing with us at Your Designs This Time!